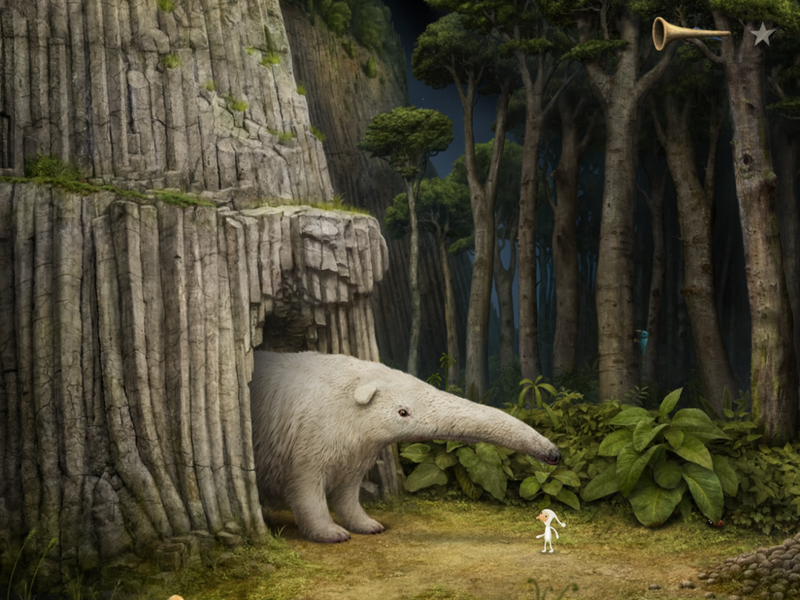 I confess, it took me a little while to warm up to Amanita Design’s Samorost 3. It’s by far one of the most gorgeous games I’ve ever played, but for the first half hour or so I was frustrated due to poor signage. The game made me think something was part of a puzzle when it was just a toy. I spent 20 minutes on the first screen because it wasn’t very obvious that I could go on to the next already. I thought I needed to complete something on that one, and the hint book I accidentally opened didn’t make me think otherwise. It showed me doing something with the telescope, which I had already messed around with. It wasn’t a puzzle, so having it in the hint book just confused me more. But once I got used to the game and understood how it works, I couldn’t stop playing. The point where the game first hooked me was the second puzzle I solved. It’s a card game, where you’re given ten cards without any instructions. There are some hunters, a fisherman, some animals, water, fire, and other cards. They’re static drawings when you first see them, but place them in the tray you’re given and they come to life. Based on what’s there, you make an educated guess of what the goal is. You mess around, make some mistakes, but work it all out eventually. And the mistakes are entertaining, such as when the deer gets eaten by a giant squid. That puzzle was where I first thought, “wow, this is something special.” It’s definitely one of the most memorable puzzles I’ve encountered in all my adventure gaming years. And I’m not really sure anything else in the game topped that. It’s just the perfect blend of fun, charm, and cleverness, without any frustration or tedium. It’s exactly how I like my puzzles — playful, laid back, and logical but requiring some trial and and error. 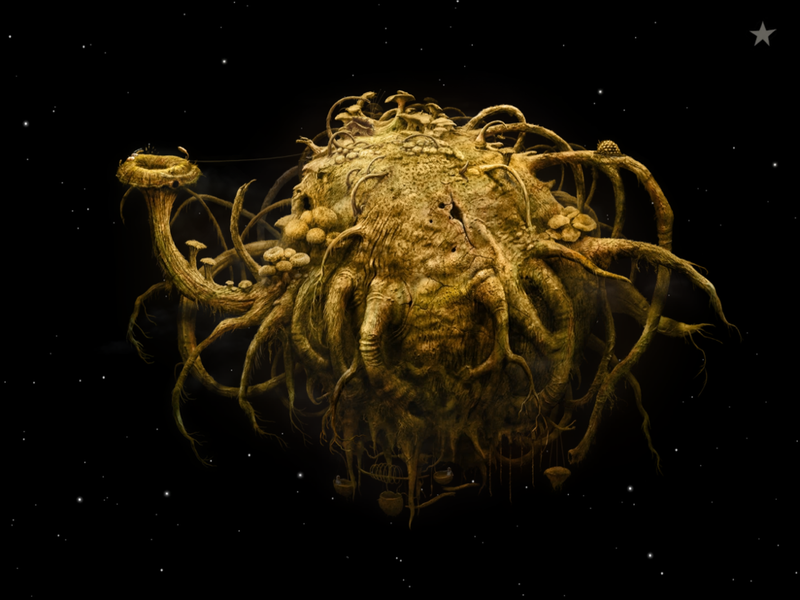 Along the way, you’ll encounter all sorts of strange flora and fauna. There are tons of creatures and plants to poke and prod to see how they react. 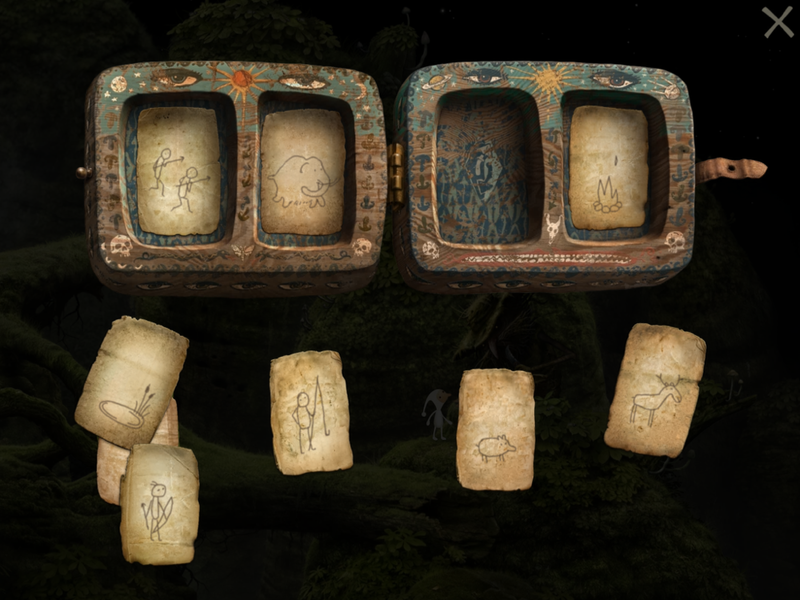 Some are part of puzzles, others are part of hidden achievements, and others are simply there for fun. 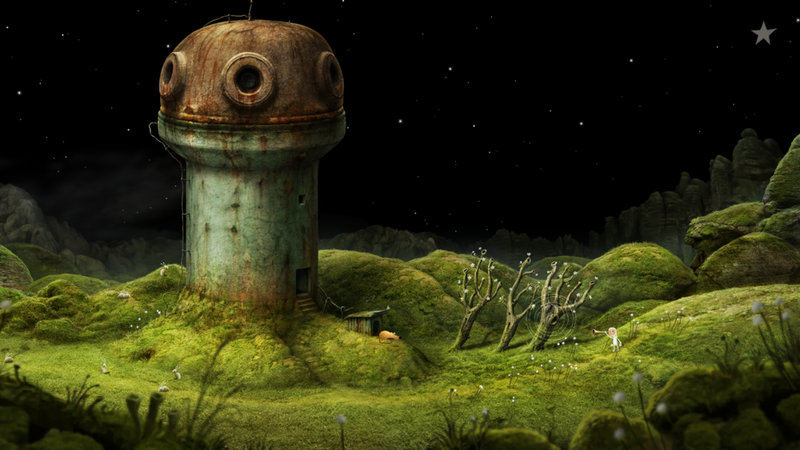 While Samorost 3 is most definitely a game, and some of the puzzles are downright tricky, it’s also a toy. There’s so much to play with, that you’ll want to take your time and make sure you don’t miss anything. Just about everything reacts to your pokes or to a tune from the gnome’s flute. One of my favorite creatures is the tortoise with the bubble wrap shell. You can pop the bubbles endlessly if you wish. So while it’s most certainly a satisfying puzzle game, the puzzles are icing on the cake to what is a breathtaking world that would be entertaining on its own to just explore. The soundscape combined with the visuals make for a must-have experience. There are a lot of truly unique puzzles in the game, but some do involve backtracking or other tedious jobs. The ones that stood out for me were those that didn’t require anything else but what you see on that screen, so there’s no need to worry about missing something on the other side of the planet. Besides the cards puzzle I mentioned earlier, there’s one involving a termite colony that really clicked with me. Once again, it involved tinkering to find the solution, and it was all logical. But other times, I would do a lot of work to get to an area just to realize that I needed to do another step first. So that was a lot of wasted time. But for the most part, you’re restricted to a single area before you can move on, so you can’t do things too out of order. It is easy to miss achievements, but you can revisit all planets at the end of the game to try and find anything you overlooked. And the achievements were one of the best parts of the game for me, as they encouraged me to fiddle around with everything and make sure I cracked open every bit this game has to offer. One thing I really appreciate is the generous number of save slots. The game auto saves constantly, but you can also save your game at any point to one of sixteen slots. This means if there’s a particular section of the game you really like and want to revisit often, you can keep one of your slots saved at that point. I have a slot for each planet, as well as some of my favorite locations, like the cicadas in the video I showed earlier. I would caution that you clear up some space on your device, though. When I went under a gigabyte, the game started losing my more recent saves. If you want to be sure they’re safe, I recommend having at least one or two gigabytes free at all times. There was also a little bit of lag between my commands and the gnome’s actions. I didn’t play on PC so I can’t compare, but I’m guessing that the game is just a lot for iOS devices to handle. Also, he’d very rarely go somewhere I didn’t tap, wasting a little of my time. Or the game would freeze up because I tapped before it was done with an animation. These were rare instances, though, and rebooting usually fixed it. I never had a bug corrupt my game permanently. Except for the few issues I mentioned, the game is a perfect fit for touch screens. Like most point-and-clicks, tapping or dragging something with my finger feels more natural than with a mouse. To me, an iPad in my lap is the perfect way to experience this game in all its glorious detail. I didn’t play through that much of it on my iPhone since iCloud isn’t working at the moment. [Update, 9/14/2016: iCloud has been fixed and now works flawlessly!] But I did mess around with it a bit and it seemed to work fine. I did notice that the wide iPhone screen has one benefit over the iPad version. You can zoom out and see the whole screen at once, whereas on iPad you have to swipe left and right to see everything, even zoomed out all the way. Also, perhaps to make up for the small screen, the tiny arrows I complained about on my iPad are much more obvious on iPhone. I don’t know if any puzzles are hard to pull off on there since I just messed around for a bit, but zooming in should help with any tight spots, I imagine. Another thing I loved about the game is how the story is told and the clues are given. There are spirits that inhabit plants and other objects. If you interact with them using the magic flute, they might tell you their story or show you — through an animated sketch — what they want from you. Some can be downright odd, such as asking you to cut them open with a knife. Others might simply have a sad tale that they wish to share, hoping someone might be able to help. 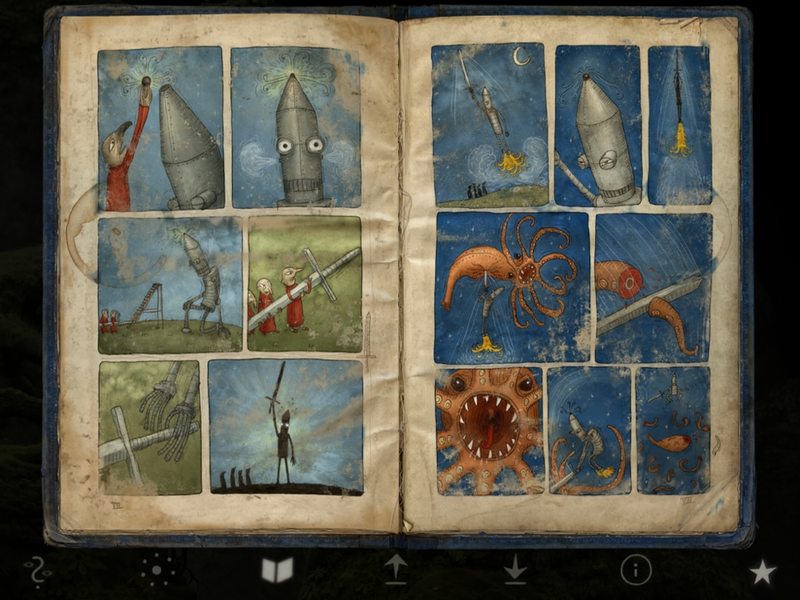 The game has no words, so everything is depicted through drawings. Once you get used to it, it’s quite charming. And impressive how seamless it all is. Just take your time and soak in the details. I should mention that the second and third sections had the most to do and the most life on them. The last two sections felt more barren and had fewer surprises. It’s almost like the earlier parts were too ambitious and they couldn’t keep up. It was still an enjoyable ending, but I would have liked to see some of that magic we experienced in earlier parts of the game. It’s too bad it couldn’t stay that strong through the end, but I’m glad we got what we were given. There are also some extra achievements to look for at the end of the game, so that makes up for it a bit. Even though the earlier puzzles were more satisfying, the weaker parts still had far more character than most other games out there. And it’s not like the last two sections of the game weren’t magical. It was just a tad disappointing after the huge buildup from the other planets to have the last areas you visit be less interesting. There is the odd puzzle here and there that doesn’t feel very logical or intuitive, and I did occasionally consult the built-in hint book. But there’s so much to like here that it’s easily forgiven. The frustrating or tedious bits can be overlooked because the game as a whole is just so obviously a work of love. If something isn’t fun for me, it feels like an oversight at the most. It’s hard to imagine that the developers had any but the purest intentions with their creation. They simply wanted to make something special. Even when I’m forced to watch the gnome scurry across the screen instead of just teleporting to the other side as in many other games, it doesn’t seem like it was an attempt to stretch out the length of the game. Rather, it seems like they just want people to relax and enjoy the sights and sounds that they lovingly crafted. I mean, how do you not stop and watch the little gnome dance for a few minutes? I even had the game open the other night to the forest creatures while I was eating dinner and realized how relaxing the sounds could be. So I just left it like that and felt like I was eating dinner in a forest. I wish I could leave it on while I sleep! While there is a clear ending to the game, it also keeps the option open for a potential sequel, and I hope that was intentional. I didn’t play the first two games, but this is one universe I would eagerly step into again. 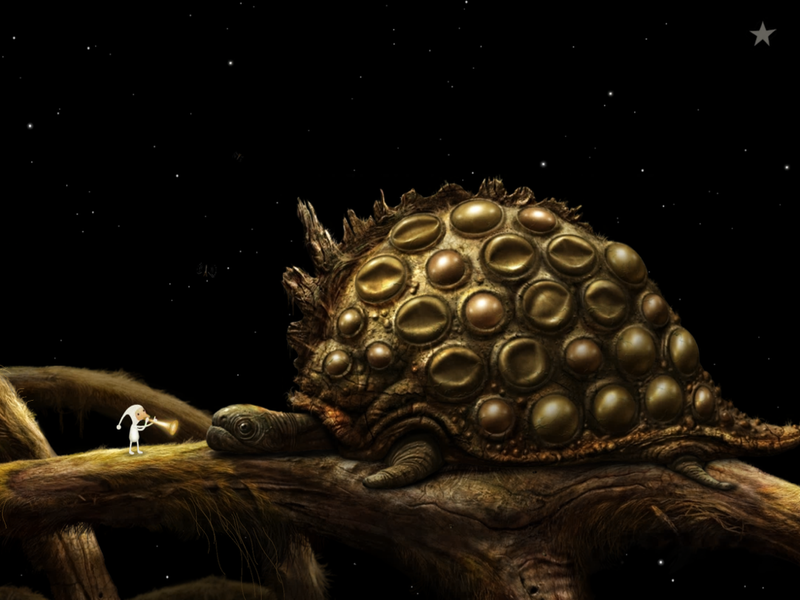 Samorost 3 is an easy game to recommend to anyone who doesn’t need their games to be fast-paced or action-packed. If you’re looking for a unique point-and-click adventure with a ton of heart, search gnome more and download the game here. And here’s another bonus dancing video. I really like to watch him shake his groove thing. 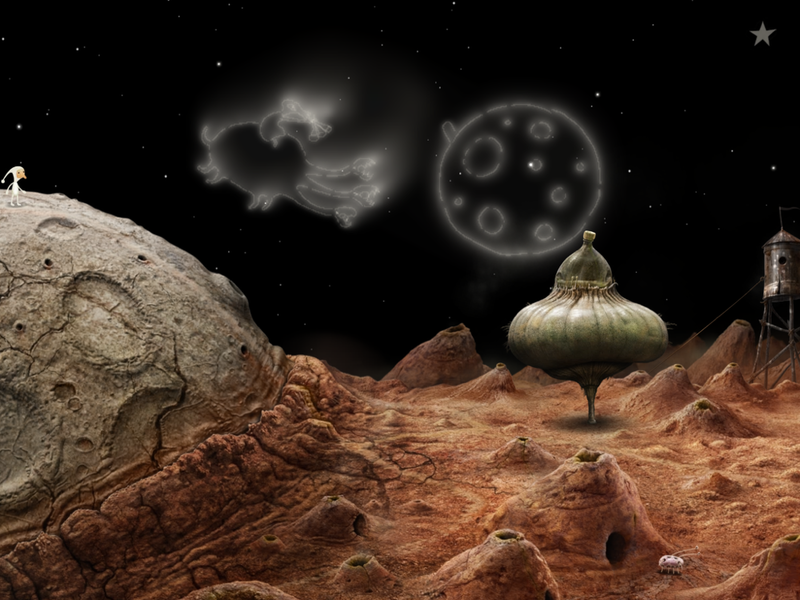 If you need help with anything in Samorost 3, try my detailed walkthrough guide. Which sequence are you trying to follow? Cool! 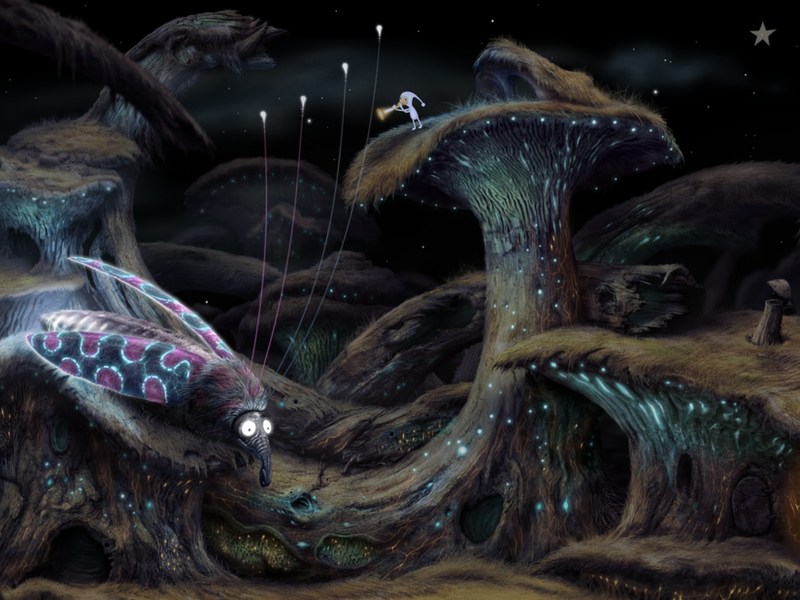 I loved Machinarium by Amanita, so I’m looking forward to checking this out. Another game soundtrack I really like and also downloaded is the one that goes to “Year Walk” – also by the same guys who did “Device 6.” I recommend it.